Traditions surround us: brides wearing white for their weddings. Kissing the Blarney Stone in Ireland. Throwing a coin in Rome’s Tivoli Fountain so that you’ll return. It’s fun when hotels develop a tradition of their own, too. Here are a few hotel traditions that you can take part in, from Florida to Hawaii to Guatemala. Back when the Clearwater Beach Hotel resided where the Sandpearl Resort (Florida) is now, the ringing of a bell called guests to supper. 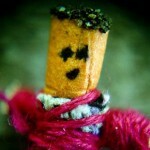 Every evening at sunset, the ring it made meant different things to different people. To some, it signified the end of a day lounging in the crystal blue water. To others, it signified another delicious meal. Nowadays, a different guest (usually a child) is chosen each evening by the resort’s mascot, “Ridley the Turtle,” to ring the bell. It is done in tribute to the day’s passing and the evening’s future. Photo courtesy of Sandpearl Resort. Every night at sunset guests of the Marco Island Marriott (Florida) and patrons of Quinn’s restaurant can enjoy an incredible spectacle on the beach. At the start of sundown one guest is selected from the crowd to bang the gong. The sound of the gong symbolizes the start of the performance: a Polynesian fire dancer honors sunset each night with a traditional blowing of a conch shell while entertaining guests with a 15-minute fire dance on the resort’s private beach. 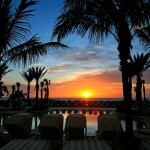 Photo courtesy of Marco Island Marriott. 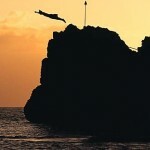 Across the country and the Pacific Ocean, the Sheraton Maui ends each day with a Cliff Dive Ceremony. As the sun begins its slow dive into the ocean, torch lighting signals the nightly ritual of Lele Kawa (cliff diving). Legend tells us the last chief of Maui, Kahekili (Thunderer), proved his spiritual strength by leaping from sacred Pu’u Keka’a to the Pacific. With sunset painting the sky, a young cliff diver honors his heritage each evening by re-tracing footsteps in the sand on Kaanapali Beach. A chant of old Hawai’i begins the progression of our warrior; the echo of the conch shell announces his arrival. 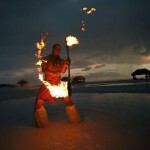 He leaves a trail of glowing torches surrounding the lagoon as he makes his way to Black Rock. Upon reaching the summit, he offers his torch to the ocean below, casts his flower lei into the sea, and finally takes the breathtaking dive from Black Rock into the rolling surf below. Photo courtesy of Sheraton Maui. In addition to the traditional chocolate on your pillow, Casa Palopo gives each guest a set of miniature, handmade Worry Dolls. Before going to bed, tell one worry to each of the dolls (they come five to a pouch), then place the dolls under your pillow. According to legend among the Guatemalan highlands, the dolls will take your worries away while you sleep. Have you come across a hotel tradition that you took home with you?